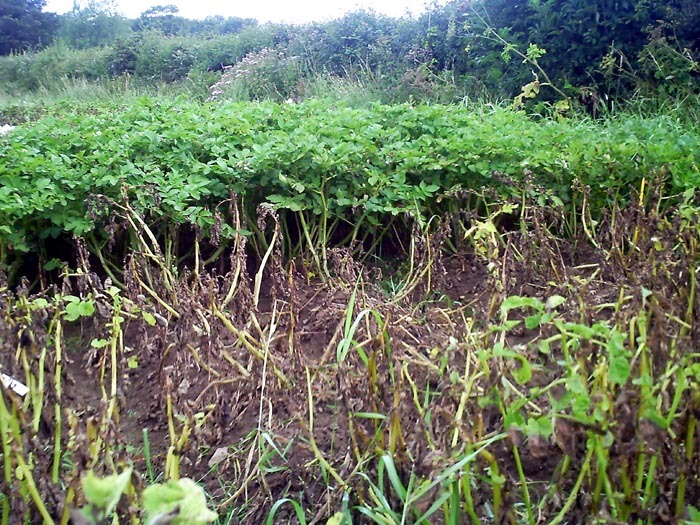 Historically, organic potato producers have been able to use copper based fungicides as a ‘last resort’ to manage blight. 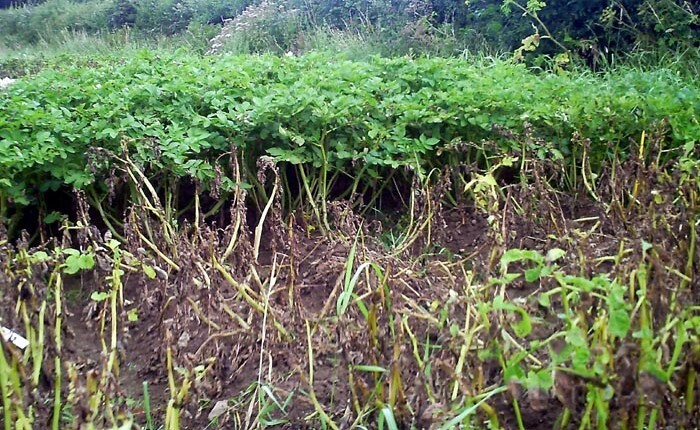 However, as I’m sure growers are well aware, to all intents and purposes this came to an end last year when the re-registration of for use on potatoes was declined on the basis of insufficient/out of date data. For most growers, it’s a challenge. For SPL, it’s an opportunity. This was the background to a trip I made to Berlin last November to attend the European Conference on Copper in Plant Protection. I went partly to bring myself up to speed with the regulatory ins and outs and to better understand the situation at EU level. But mainly I was there to spell out the contribution Sarpo varieties can make to managing blight without copper. I don’t have UK figures to hand, but German data presented at the conference indicate that on average, of the 8600 ha of organic potatoes were grown there, only 25% were treated with copper, and even then at rates below 2Kg/ha/year; well below the 4kg/ year limit set by the EU. Not too bad, you might think, but that doesn’t take into account variations in blight pressure from year to year. These figures were averages between 2012 and 2015. Last year the blight pressure was just immense right across Europe and I’m willing to bet that usage rocketed in 2016. I think it’s the fact that UK producers growing more susceptible varieties no longer have the capacity to deal with sudden and severe outbreaks that’s causing most of the anxiety. Varietal resistance has always played an important role in managing pest and disease problems in organic cropping systems. The withdrawal of copper, I would argue, makes resistant varieties absolutely essential. The Sarvari Research Trust, which breeds the Sarpo varieties is a key player in developing resistant cultivars. We are not the only ones active in the area, but with a suite of 7 varieties, collectively covering a broad range of maturities, culinary uses and skin colours we have a highly attractive offer. While Sarpo varieties are well known in UK, at least among growers, we have a lower profile in Europe. We therefore generated a great deal of interest among the delegates; not just the growers, but the supply chain businesses, researchers and the German Federal Environment Agency, regulators who are pushing the copper reduction agenda hard. With a broad range of resistant varieties already available, and ongoing breeding programmes to ensure they remain available in the longer term, you could argue that it’s not primarily a technical issue, but more a problem of introducing new varieties into a market that can he somewhat resistant to change! The Louis Bolk Institute in the Netherlands has been doing a lot of work to support the introduction of new resistant varieties to the market. They found that retailers, especially those with a strong environmental focus, were open to including resistant varieties in their ranges as part of their commitment to supporting organic/ sustainable production. The Institute helped to organise ‘Potato Week’ in the Netherlands working initially with ‘The Green Store’ to launch five new blight resistant varieties with taste tests and customer feedback sessions. The project was very successful and other retailers have now followed suit. This, and other success stories indicate that introducing resistant varieties, while far from easy, is eminently feasible. Customer acceptance is crucial as growers will only grow varieties that they can sell. At the same time, the search for biologically based alternatives to copper is gathering pace. The conference reported on the potential of a wide range of products including beneficial bacteria, yeasts, and plant extracts. One of the most promising – certainly one nearest the market – is a fatty acid-based product being developed by Neudorf, and which is currently working its way through the regulatory system. Saponins, found in a range of plants, including quinoa and ivy, have long been known to be effective against the blight pathogen. Labs from Britain to Bolivia are currently working on its formulation to improve its efficacy. The Sarvari Research Trust is testing saponin from ivy in a field trial in mid Wales in 2017. Watch this space! You might think that if we have resistant varieties, we don’t need these alternatives; I’m not so sure. Resistance is a precious commodity, but the higher the blight pressure, the sooner it’s likely to break down. If these products can help reduce that pressure by helping to keep resistant crops blight-free they should help to protect varieties from breakdown of resistance. Using both resistance and bioactive plant extracts to top up the resistance seems the way to go. So, a useful and important trip. If we can build in the links we made in Europe, and capitalise on the interest we generated, it will have been more than worthwhile.